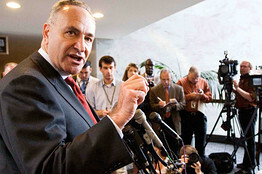 “A long history in distress”: Senator Schumer in Rule 10b-5 stock fraud scheme? Many Americans think of stock fraud as a one-way street in which a seller tricks buyers by overstating the value of equity or debt. The reality is, fraud cuts both ways. Lying low is just as fraudulent as lying high. Senator Chuck Schumer (D-NY, pic right) should know. He is a member of the Senate Banking Committee and represents America’s financial capital. Yet, evidence suggests that when Senator Schumer triggered the collapse of IndyMac Bancorp back in July, he may have been trying to manipulate downward the company’s value on behalf of campaign contributors who were looking to buy. If true, Schumer could be prosecuted or sued for securities fraud.